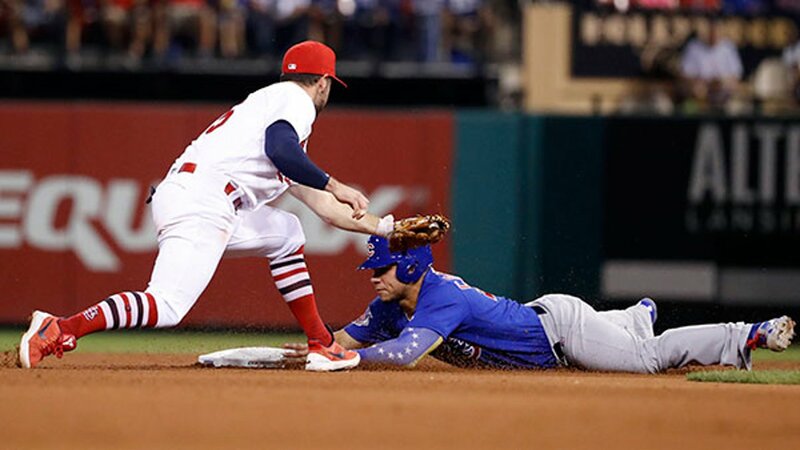 ST. LOUIS (WLS) -- The Chicago Cubs' magic number remains one after losing to the St. Louis Cardinals Tuesday night. The Cards beat the Cubs 8-7 in St. Louis. The Cubs are one game away from clinching the National League Division title. The Cubs could have clinched Tuesday night if they had won against the Cardinals or if the Milwaukee Brewers had lost against the Cincinnati Reds. The Brewers beat the Reds 7-6. "It would be nice if they could clinch at home, but I'll take it any way they can do it," said Cubs fan Frank Mosey. Monday night the Cubs dominated the diamond in St. Louis against the Cardinals. Addison Russell had a three-run double in the first inning alone and then he delivered in another way - nachos for the fan whose plate fell when Russel dove into the stands a few innings later. Cubs crushed the Cards, 10- 2. "They've been playing very good ball recently," said fan Ronald Jordan. "They're peaking at the right time, going into the playoffs, which is what you want. And based on the players they had last year and the acquisitions this year, I think they have everything that they need." Fun Fact: This week in 1935, the Cubs clinched the NL pennant in a double-header sweep of the St. Louis Cardinals. Chicago Cubs' Ben Zobrist, center, celebrates his two-run home run against the Milwaukee Brewers as he enters the dugout on Sept. 24, 2017. Last year, the Cubs broke a 108-year World Series championship drought. But can they shake the championship hangover that has plagued other teams? If they win, the Cubs would become the first world champs in 5 years to make it back into the playoffs the following season. Fans are excited, but it's definitely a different feeling from a year ago. "After last year, winning it all, and winning it in such dramatic fashion, in the seventh game of the World Series, that's tough to beat," said retired sportswriter Fred Mitchell. For the parents of World Series Baby Luke Wessels, a 2-month-old who was conceived during last year's Cubs celebrations, they hope he will get to witness a World Series in person. "Probably not the same, but it is still exciting for sure," said mom Beth Wessels. Cubs fan Craig McCudden, who lives in Los Angeles and drove to Chicago to take in the season-ending series this weekend, also said a second World Series win would just be gravy. "I don't care if they ever win the World Series ever again," McCudden said. "I'm satisfied. If they do it now, it's just gravy." Ticket brokers said that after last year's record-setting ticket prices for the World Series, tickets sales this season have been more disappointing. "There is demand, but it's nowhere near what it was last year. It's like 30-40 percent less," said ticket broker Steve Buzil.